No bad story or bad JUJU!!! I just ended up getting a different dress. Never worn. Has been stored in the garment bag in an unused closet. Tags still attached. No marks/ stains/ rips Plastic wrap from manufacture around beaded belt still intact. The back detail looks like a million beautiful buttons but don’t worry it’s a very quick zipper! Very full ball gown. No alterations have been done to it yet. I am 5’4” this dress is very long so there is room for alterations or if you are taller you don’t have to worry about this dress showing your feet. There is somewhat of a train on the dress that is gorgeous. Just picked up from bridal shop and brought it home. 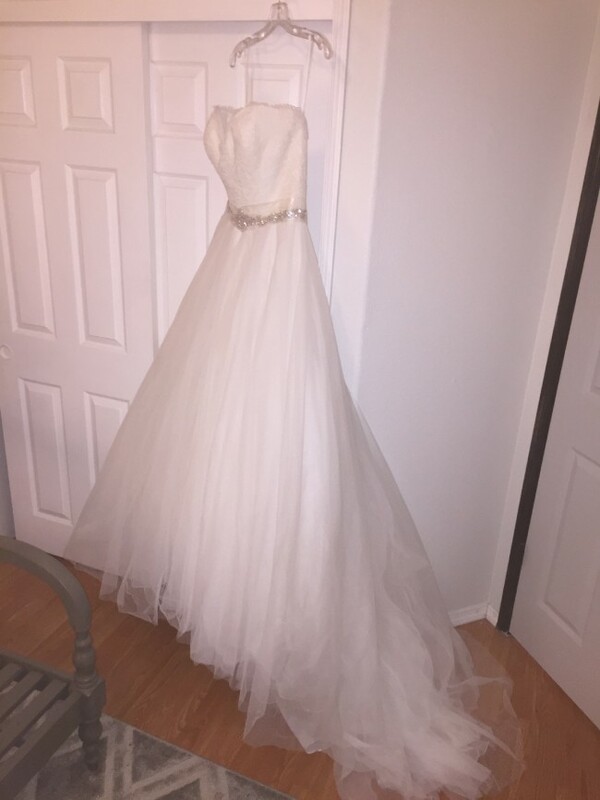 I am motivated to sell this dress! Please message me with any questions!